It's hard to find Icelandic beer in Manitoba - the amazing Lava Stout hasn't been available in Manitoba for a few years now so for the most part. Seeing Manitoba has the largest Icelandic population outside Iceland, you would think we would have better access to Icelandic beers. Thankfully Borg Brugghús has their amazing Garún stout and now Leifur Nordic Saison Nr.32. 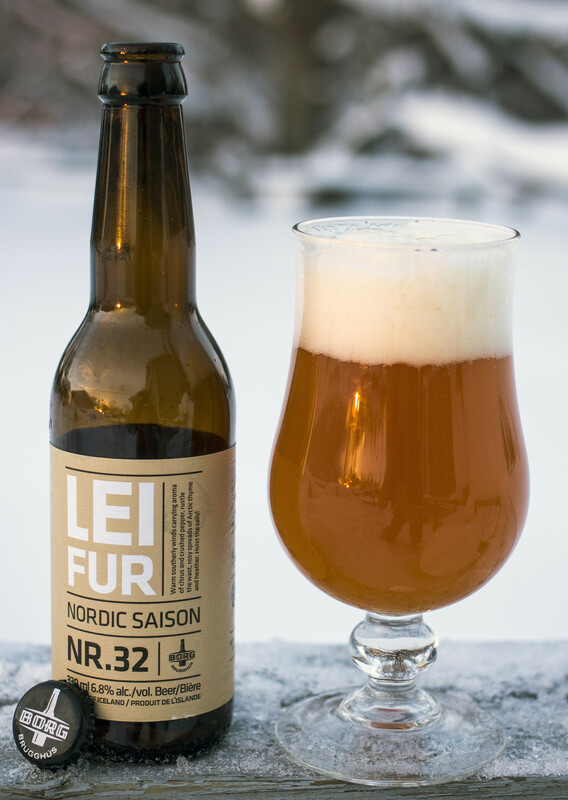 The Leifur Nordic Saison tops out at 6.8% ABV, making it a bit stronger than your typical saison. Appearance: Leifur pours a bright yet cloudy orange with a bit of microcarbonation, a thick amount of beige head that diminishes to a finger's worth of head. There's a decent amount of sediment at the bottom of the beer glass. Aroma: Quite a bit citrusy with lemon, a bit of a sour fruitiness to it, yeast and a heat of orange. Taste: This is reminiscent of your typical saison, it's a citrus-forward wheaty saison with a moderate amount of barnyard funk, notes of orange peel, bubble gum, honey, and a hint of herbs. It leaves a bit of an acidic/sour aftertaste with a hint of graininess. Overall Thoughts: Awesome saison! I don't know why this isn't available at more liquor stores in Manitoba, it's worth the $5-ish price tag. It's citrusy, light fruitiness and a bit bready. I can't wait to have this again and again! The beer is named in honour of Leifur Eiríksson (Leif Erikson), the first European explorer to discover North America.